THE MORE POSITIVE ARCHERY BOARD WHERE WARM BEER IS AN ACCEPTABLE SUBSTITUTE FOR BREAST MILK, EVERY DAY IS YOHON'S BIRTHDAY, AND HOWATTMAN SETS THE STANDARD FOR DEVIANT BEHAVIOR. I told Randy to tell you the 1st thing I did was put a Weather rest on the bow, his response....."I'd just as soon NOT"
"they all deserve it" is right but this one was doomed...this one found the sunflowers in the wife's bird feeders and she told me she wanted it dead...."yes dear"
O.K..... so I admit that I have a wee little problem with Bear bows. I like the T/D's a LOT! When Bear reintroduced the T/D back in 2011 I ended up picking up an A & a B in the Dymondwood. Then an A & B in the Bubinga risers. Next year they brought out the grey Futurewood and I picked up an A & a B. The next year they brought out the two tone Bubinga and grey Futurewod risers. I picked up a B but had held off on an A for awhile. Well, Big Jim had his Memorial Day sale on Bear bows and I rectified that situation. Here is my two tone "A" riser with #3 limbs making a 60" bow. This one is about 64-65 pounds at my draw length and very, very purty! Being one of the guys who likes the compass in my riser I was glad to get one that had it as they have discontinued them for 2015. Although the photo doesn't show it all that well, the Bubinga has beautiful grain. Nice thing about it is that I do have a couple different sets of limbs to trade around on it. As a matter of fact, it is headed to the club this morning with a set of red tip, black wedge limbs on it. Of the two current variations of the limbs, I actually like the Bubinga wedge better on the white tips than the Black dymondwood. But the limb tips look so much better on the red tip limbs. A stack of alternating red and black material that comes out real nice once it is ground and finished. The white tips just have a single piece of white material stuck on the tips. Here is a great looking 1974 Bear A Mag riser that I bought off one of the guys in the P.B.S. I found a good looking light colored gray Futrewood riser with a set of #1 limbs on it. I had a buddy that wanted the #1 limbs and I sold them to him and then bought a set of new 45 pound #3 limbs for the riser. Makes a 60" bow that is about 47 at my draw. Another friend liked the looks of the Gray riser after I got it in and offered to buy if off me. That very night I found a smoking deal on the exact bow that he was interested in. 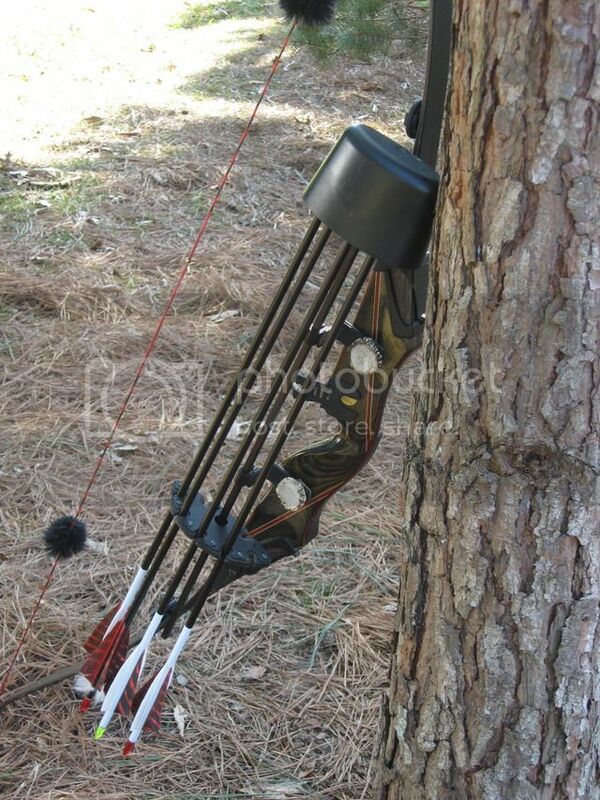 I ordered it in and as he has a beautiful Bubinga bow with #3 limbs that are 57 pounds, we just traded. Well... added another one to the rack. Being a huge fan of the birthmarks in some of the Bear Futura wood risers, when this one was listed last week I had to jump on it. I paired it with a set of 60 pound #1 limbs so it is 60" & 60 pounds. Wait'll you turn that one loose on the local Sika herd. You guys are kill'n me. I've had a soft spot for Bear Takedowns since the early 70's. Got my first one in about 76 and shot them for 20 years. I'm going to have to get my B riser out and shoot a few arrows. I haven't shot it for years. Do yourself a favor Jim, if you decide to shoot your Bear T/D, try out some of the new limbs coming out of the factory. Narrower profile, deeper hooks in the recurve and smaller, better finished tips. There is a world of difference in the limbs they were producing ten years ago and the new ones.